Seattle-based Alaska Airlines is offering an introductory one-way fare of $199 for tickets purchased by March 9 for travel on Mondays and Thursdays between April 15 and June 6, 2015. Alaska Airlines is launching three-times-weekly, non-stop service between San Diego and Kona on the Big Island of Hawaii on March 5. Bombardier Commercial Aircraft has won firm sales on March 31 from three airlines for three more CRJ900 NextGen regional jets and four more Q400 NextGen turboprop regional airliners, and has booked options on four more Q400 NextGens. Hawaiian Airlines plans to launch non-stop service between Honolulu and China’s capital Beijing in April 2014, pending approvals by U.S. and Chinese regulatory agencies. However, Hawaiian will discontinue its under-performing non-stop Manila service this summer, its last outbound flight on the route leaving Honolulu on July 31. A newly formed holding company owned by Lawrence J. Ellison, the third-richest U.S. citizen, has bought Hawaiian regional airline Island Air. Island Air, a regional carrier in Hawaii, has signed a letter of intent to lease five ATR 42 turboprop regional airliners. Honolulu-based Island Air signed the lease agreement with Chicago’s Aerway Leasing, LLC. Hawaiian Airlines is launching three-times-weekly, non-stop service between Honolulu and Auckland in New Zealand on March 13, 2013. According to Hawaiian, it will be the only U.S. carrier flying to Auckland, which is New Zealand’s largest city. Members of both carriers’ frequent flyer programs will be able to earn and redeem loyalty points or miles for travel on either airline. 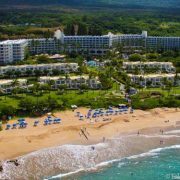 Travelers will also be able to connect between the two carriers to points throughout the East Coast and Hawaii, with the signing of a new codeshare agreement.